The Spokane Chiefs hold a 3-1 lead in their best-of-seven Western Hockey League playoff series with the Portland Winterhawks and can advance to the second round for the first time since 2013 tonight at the Arena. After splitting the first two games in Spokane, the Chiefs overcame two-goal deficits in the third and fourth games in Portland, needing a hero in overtime in both to take the commanding 3-1 lead. It was Riley Woods with the overtime winner in Game 3, Adam Beckman in Game 4. The Chiefs’ lineup got a boost when defenseman Nolan Reid returned to the lineup in Game 3. Reid, who took a stick to the face early in Game 1 and didn’t play in Game 2, had an assist in each game in Portland. The Winterhawks’ Cody Glass – who was expected to be ready for the playoffs, according to reports – still hasn’t been in the lineup. The absence of Glass, who has been dealing with a lower-body injury since January, leaves Portland without one of junior hockey’s top centers. Without Glass, Josh Paterson has been a nice substitute. Paterson, who had 22 points in 27 games with Portland after being acquired in a trade with the Saskatoon Blades, leads the Winterhawks with six points in four games and scored two goals aiece in the second and fourth games. 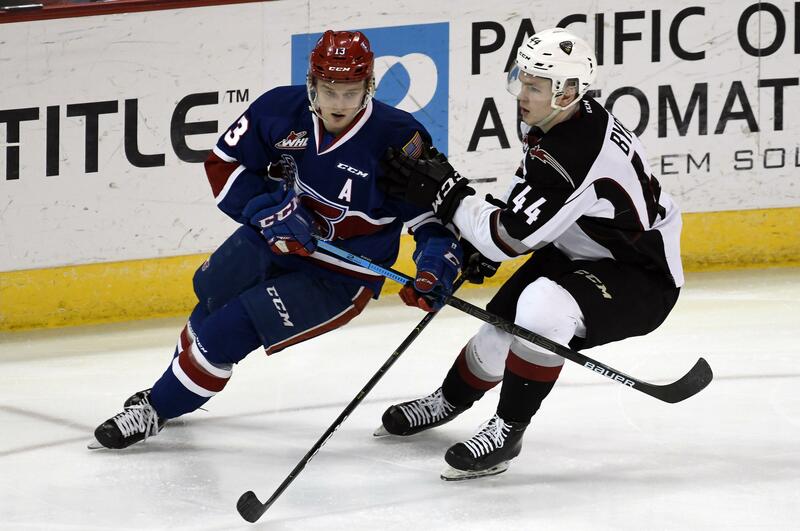 Riley Woods leads Spokane with six points in the series. The Chiefs are getting offense from a number of players, their forte during the regular season. Ten players have goals, and six have multiple goals. One of those players is Luke Toporowski, who had goals in the third and fourth games. Toporowski was a scratch in Game 2 after taking three penalties in Game 1. The officiating has become a series subplot. After combining for 13 power plays in Game 1, Spokane and Portland have combined for five power plays in the past three games. The Chiefs had three in Game 4. After leading the league in power-play conversions in the regular season, the Chiefs picked up right where they left off. Spokane has scored on 5 of 9 nine power-play chances, while Portland is 2 of 9 with the man advantage. Beckman’s OT winner in Game 4 came on the power play. There has been a stark difference in goaltending through the four games. Spokane’s Bailey Brkin has a steady .907 save percentage, while Portland’s Joel Hofer’s sits at .867. If Portland opts to sit Hofer, it’ll be Shane Farkas in net. Farkas had a .906 save percentage in 50 games during the regular season. After switching goaltenders in last year’s first-round series with Portland, it’s safe to assume Brkin is the man in net for Spokane. The Chiefs are in a good position heading into Game 5, but there’s no doubt the team remembers being on the other end last season. It was a year ago when Portland held a 3-1 series lead, only to see Spokane win two in a row to force a Game 7, when Portland prevailed. The Chiefs will try to end the series when the puck drops tonight at 7:05. Published: March 29, 2019, 5:31 p.m. Updated: March 29, 2019, 7:19 p.m.